Unprecedented power combined with uncompromising workmanship. 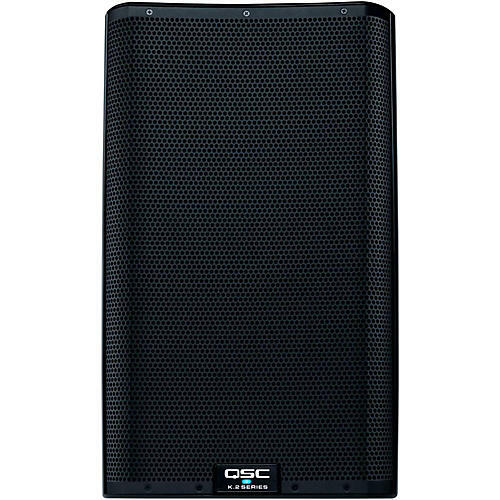 The 12” QSC K12.2 2-way powered speaker sets a new standard for portable PA systems. It features a Class-D amplifier with 2,000W peak output. This amp can route nearly twice the power to the woofer than that of its predecessor, the K12. It’s also packed with high-tech features including advanced signal processing control. The result is improved live sound performance with more robust bass. This full-range active speaker lives up to QSC’s reputation for excellent build quality and reliability. It’s ideal for mobile DJs and live musicians. The K12.2 is also great for permanent installations including nightclubs, churches and houses of worship. Both lightweight and compact, the K12.2 is very portable. Its ergonomic top and side carry handles make it easy to transport from your car to a gig. The rugged molded cabinet is angled for use as a floor wedge monitor. A tough, powder-coated steel grille protects the speaker’s drivers. It’s the perfect blend of power, ruggedness and modern styling. Don’t let the K12.2’s small footprint fool you. This PA cabinet packs a hefty punch. When you crank it up, you’ll swear you’re listening to a larger loudspeaker. Its efficient amplifier is perfectly matched to its drivers for optimal performance. The amp stays cool thanks to quiet variable-speed fans. With 2,000W under the hood, this powerhouse can hit a max SPL of 132dB. Even at high volume, the QSC K12.2 powered speaker maintains clean sound. Don’t be surprised if you get compliments on your sound system when you take a pair of these speakers to your next gig. They can really rock without sounding like they are working hard at all. QSC’s Advanced DSP with Intrinsic Correction makes it easy to get amazing sound, in any setting. By eliminating the K12.2’s natural audio variables, this technology leaves you with the purest audio possible. It also avoids distortion and protects the drivers from damage. The K12.2 will sound its best, even when it’s maxed out. Eleven DSP factory presets let you customize the speaker’s sound. Compared to the legacy K12 powered speaker’s five DSP options, the K12.2 offers eleven settings. The user-friendly LCD menu of the multifunction display lets you select the contour that fits your venue and application. For example, the Dance setting delivers improved bass performance and emphasized highs. It does this, in part, by diverting more power to the woofer. The Live setting emphasizes midrange frequencies for vocal clarity. The Stage Monitor 1 setting reduces excessive bass build-up on stage. Other presets include Studio Monitor, Live Bright and Bass Amp. The Multifunction display also lets you control EQ and delay settings. There are also crossover settings for using the K12.2 with different subwoofers. Once you’ve got the K12.2 dialed in for specific applications, you can save and recall scenes for future use. DJs and bassists will appreciate the K12.2’s low-frequency output. The 12” woofer cranks out tight bass that won’t distort. Even without as subwoofer, this PA speaker can hold its own, hitting lows down to 45Hz with ease. Combined with the 1.4” compression driver, the K12.2 delivers smooth, full-range audio. Adding a KW181 or KS212C subwoofer will really round out your system’s low end. But you’ll be surprised how much bass the K12.2 can put out by itself. The K12.2 can be deployed as mains or monitors in a variety of ways. Mount it on a subwoofer pole or tripod speaker stand using the dual pole cup design. The standard cup maintains the speaker vertically. The other has a 7.5° downward tilt. This allows you to direct sound toward the audience when the speakers are set up higher, such as on a stage. M10 fittings let you install the K12.2 in a flown configuration. The cabinet’s wedged shape makes it a natural fit for floor monitoring. Offering flexible connection options, the QSC K12.2 is a performer’s dream. Everyone from solo singer/songwriters to bands and DJs will find all the connectivity they could want. On the rear panel you’ll find a pair of balanced combo XLR female plus 1/4" TRS connectors with independent gain control. The first is equipped with selectable MIC/LINE level input. The second offers selectable HI-Z/LINE (High Impedance or Line) level input, specifically for musical instruments. Both inputs are connected directly to a pair of XLR/M throughput connectors. This lets you daisy-chain them to another audio device. A 3.5 mm TRS input jack with independent gain control lets you connect sources such as smart phones, computers, and MP3 players. There’s also a line-level output with the mixed signal from all inputs. For game-changing sound and reliability, order now.